Art that stimulates all our senses deliver a more profound experience and these three exhibitions bring together both physical art and sound to create fantastically engaging, playful and particularly in the case of the final piece, thought-provoking, work. Sonic Playground (above) by Yuri Suzuki is now showing at the High Museum of Art in Atlanta. 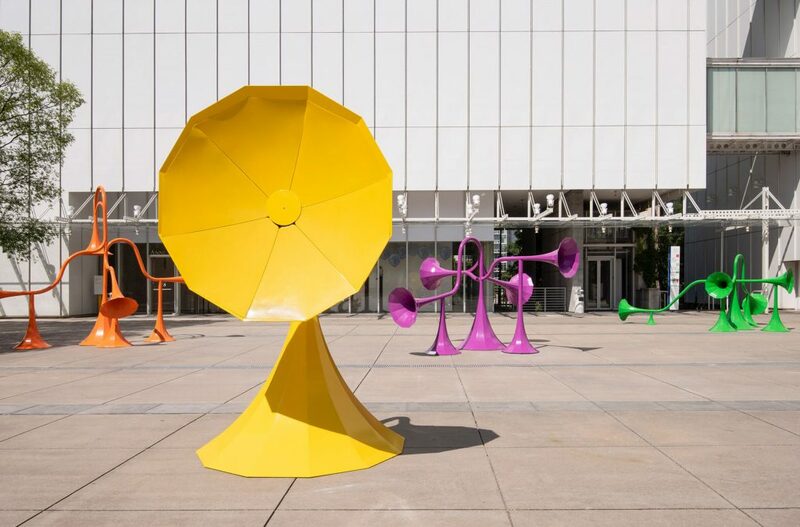 Running until October 7, Suzuki’s work comprises colourful sculptures that also transmit modified sounds. Presented in the museum’s outdoor Sifly Plaza, Sonic Playground is part of the institution’s on-going initiative to animate its outdoor space with commissions to engage visitors in participatory art experiences. Suzuki is a sound artist, designer and electronic musician who through his work seeks to look into the relationship between sound and people, and how music and sound can affect the minds. His sound, art and installations have been exhibited all over the world. 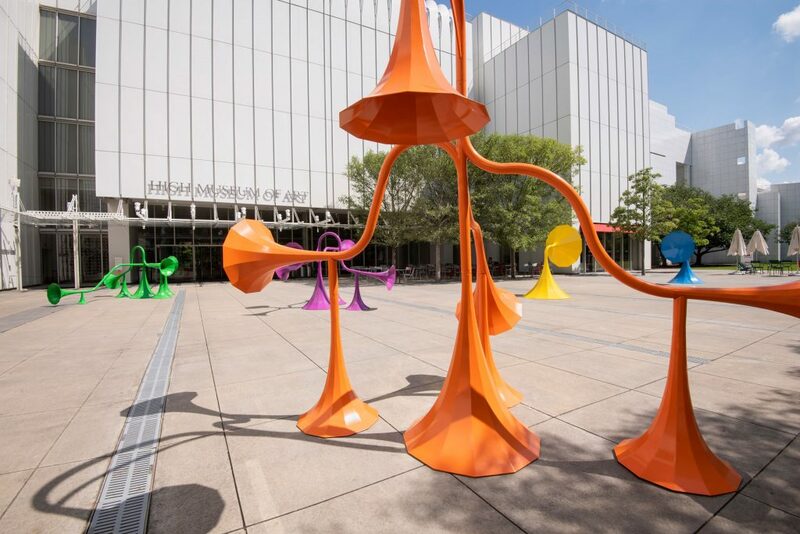 His work in Atlanta is the museum’s first venture into exploring the notion of audible play—with the installation made up of six interactive sound sculptures that manipulate sound depending on where you are standing, listening or speaking. Israeli Artist Naama Tsabar is well-known for her multi-sensory work. 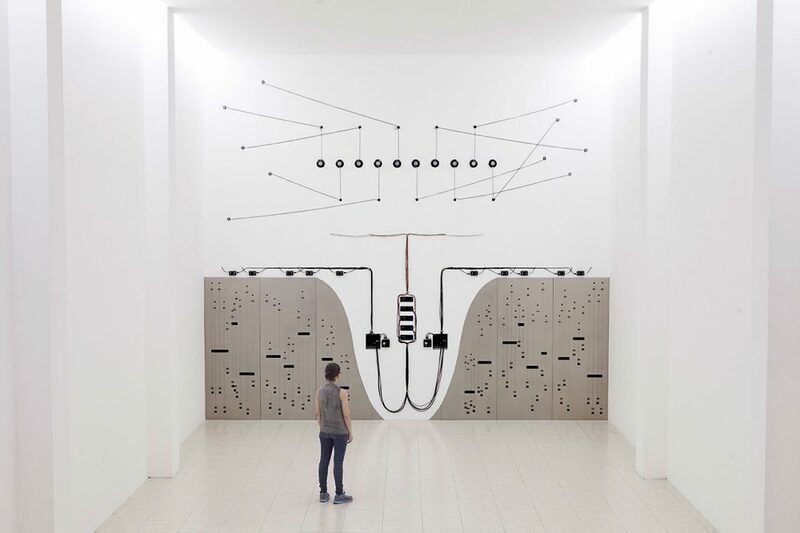 Her work – Propagation /Opus 3 (above), at the MARTE Museum in San Salvador, was designed as a “site-responsive” piece to “assume and consume” the museum structure by transforming its architecture into an enormous musical instrument. Finally, there’s still time to catch a thought-provoking piece by Indian artist Shilpa Gupta. 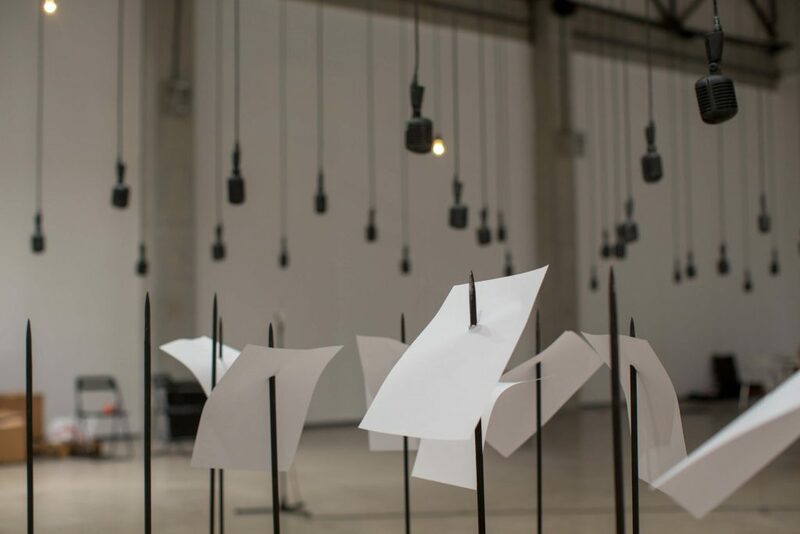 Exhibiting until August 26 at The Fire Station at the Edinburgh Festival, Gupta has installed 100 microphones suspended above 100 metal rods, each piercing a page inscribed with a fragment of poetry in a piece entitled ‘For, In Your Tongue I Cannot Hide‘ (above). The work highlights “the silence of 100 jailed poets” and features a single microphone that plays the verses echoed by a chorus of the other 99. Lasting more than an hour, the sound piece alternates between English, Spanish, Arabic, Russian, Azeri and Hindi amongst others. Much of Gupta’s work creates situations that actively involve the viewer, shifting the primary status of art from object-based commodity, to participatory experience. Born and based in Mumbai, Gupta’s work has been exhibited around the world including Venice Biennale, Berlin Biennale, Tate Modern, Centre Pompidou, Solomon R. Guggenheim Museum, Devi Art Foundation, San Francisco Museum of Modern Art, and Mori Museum amongst others. In this new work, the artist draws directly on the works of poets who over centuries have found themselves in conflict with political powers and dominant forces, as a direct result of their ideas expressed in the written form, highlighting the fragility and vulnerability of our right to freedom of expression today.